Here is another ‘wildflower’ card from the bunch I made last week. Sometimes it is fun to get out one set of stamps and play around with colours and techniques to create a range of looks. The flower is from the Darkroom Door ‘Wildflowers vol. 2″ set and the sentiment from the DD “Happy Birthday” set. I created this background with brusho paints on glossy photo paper using an impermeable mat. I sprinkled some turquoise and violet brusho on the mat, spritzed it, then swiped the photo paper through the paint to pick up the colour. I chose a grey ink rather than black to stamp but after the final result after a few impressions looks almost black. 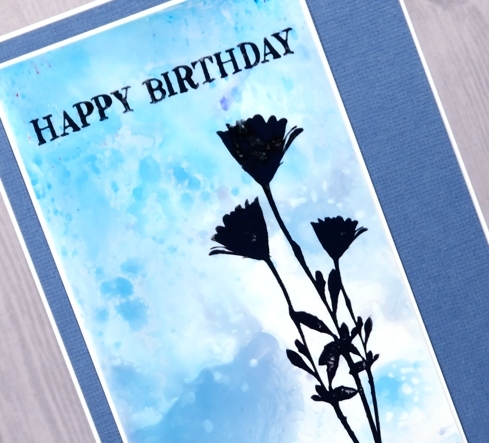 Who wouldn’t love to get that card on their birthday! 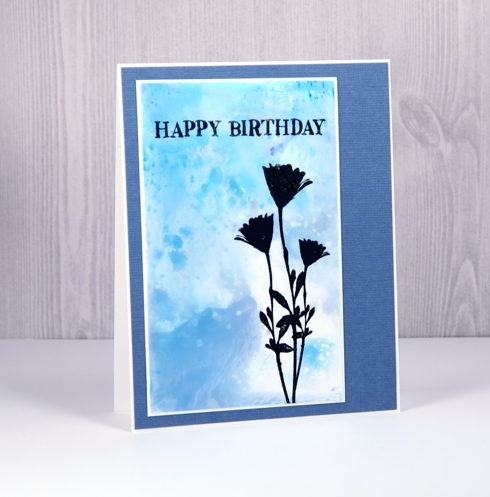 Those background colors and the black flower silhouette make for a gorgeous card! Love the black card on the great background. A wonderful birthday card. Very Pretty! I’ve used glossy photo paper with alcohol inks and spritzing with alcohol. That is totally fun too! I love the effect of brusho on photo paper -would not have thought of trying that and I have a HUGE pack of photo paper too!! Will certainly be giving this technique a try. Haven’t the DD stamps ( a bit hard to get hold of, and a bit expensive for me) but I’m sure that in my collection of several thousand stamps there will be suuitable ones!! I always like your blog posts -so inspiring. I am sure today’s birthday girl would enjoy this one!